To minimise the effect that a newborn’s sleep pattern has on the parents, here are some tips to help you create a good sleep routine for your new baby. The biggest issue that most parents worry about even before the birth of their new baby has to be the fact that sleep will become a rare commodity. We all hear horror stories of parents who are so tired that it affects their health, their work performance and even the ability to complete simple daily tasks. To minimise the effect that a newborn’s sleep pattern has on the parents, here are some tips to help you create a good sleep routine for your newborn baby. All new parents should understand that in the initial period of at least one to two months, the newborn would have no concept of day or night. And even though new babies require nothing more than milk and sleep for the first few weeks, their intermittent sleep can cause agony to parents who would have to wake every three to four hours every night to feed the baby. While there is little that can be done regarding the baby’s instinctive needs, parents can help illustrate the difference of day and night by interacting with the baby more during the day, and limiting stimulation at night. This simple habit aids babies in understanding that day is the time for noisy stimulating activities, while night is for resting and quiet time. If it is acceptable to the parents, they can also choose to minimise contact with the baby at night as to help them build independence. A newborn can (and will) easily fall asleep most of the time due to their need for rest, and if we avoid repeating certain habits to them to “help” them, they will slowly be able to associate lack of interaction to bedtime. Habits like rocking, cradling and giving them milk to aid them to sleep will only make them rely on these forms of comfort in order to fall asleep. Avoiding them will prevent the forming of bad – and very hard to quit – sleep habits down the road. The results of these practices will not be experienced immediately, but will help greatly for the child to get used to quieten down in the evenings and slowly settle down for bedtime without screaming for your attention. It will also help down the road when separation anxiety kicks in when your child is about 9 months old. Stimulate your baby by talking and playing with him in the day and try to limit his nap to no more than two hours. This will tire him out sufficiently by sunset and he will sleep through most of the night, only waking up for milk and then promptly falling back asleep again. After a few days of repeating this, your newborn would be accustomed to sleeping longer hours at night instead of in the day. 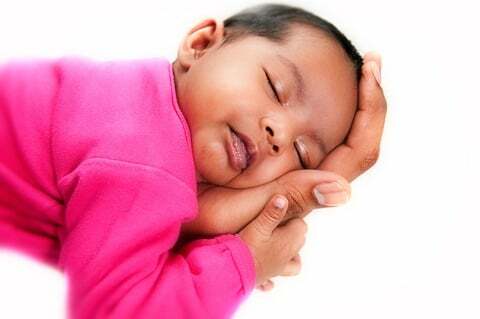 Use comforting techniques such as baby massage or lullabies to soothe him to sleep at night. Make sure it is a routine takes no more than 15 minutes and that it will end once it is completed. Otherwise, our cheeky little babies will want you to continue it throughout the night and you can say goodbye to your own much-needed sleep! Place him in a noisy daytime environment such as the living room to let him nap so that he may be woken up by common noises and prevents him from oversleeping. At night, put him to bed in a quiet and dimly lit room to sleep where there is minimal disturbances. This also adheres to the “day and night” cycle that was mentioned earlier. The most important key in creating a good sleep routine is that it must be consistent, especially in the first few months. Once you have the routine down smack, our little babies are adaptable enough to accept slight adjustments such as a slightly later bedtime. If you chose to let your child learn to comfort himself and settle down to sleep, there will definitely be some uncomfortable moments where your baby experiences difficulties in self-soothing and would want you to help him out. You will have to bear with it and let him continue to self-comfort. This is a very important step in cultivating independence in your child, and although it may be hard to hear him cry, remember that it is for the better of your child’s sleep habits for the rest of his life. It is also very important to praise your newborn for his efforts in falling asleep alone. Being praised every morning for being a “big boy” will only help to build his confidence and encourage him to try again tonight. It is also important to let him know that sleeping at night is very important and it will help him to grow up big and strong. All these are usually reason enough for them to continue the efforts on their own as you reclaim your own sleep!